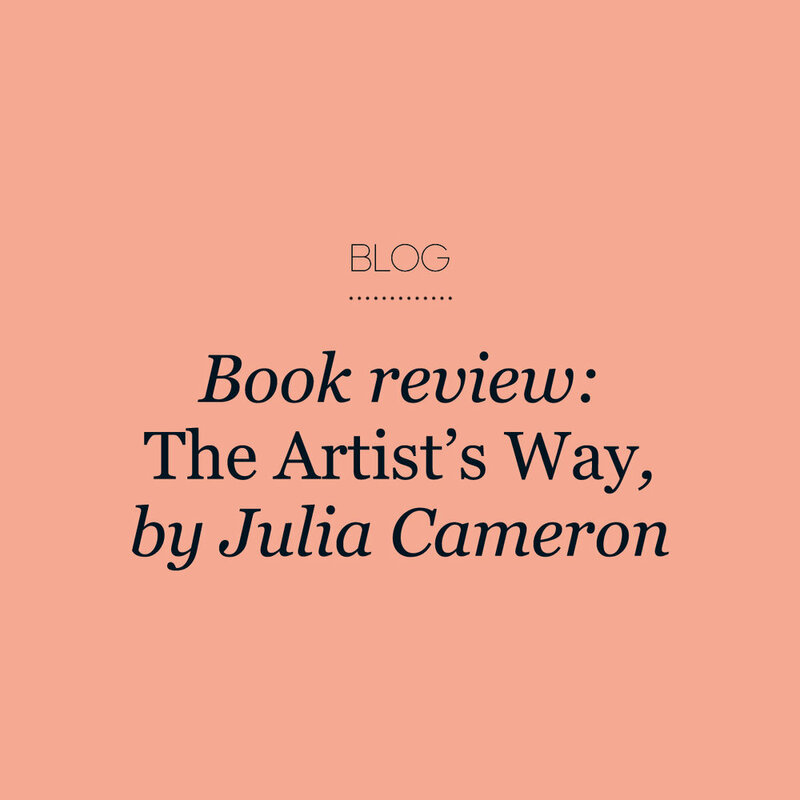 Described on the cover as “A Course in Discovering and Recovering Your Creative Self,” Julia Cameron’s The Artist’s Way is regarded by many as a way of life. The book, which turns twenty-five years old this year, is known as the creative person’s bible, helping us tap into our creative desires and ignite—or reignite—our artistic spark. The Artist’s Way is presented as a twelve-week course, working through the steps of “creative recovery.” Each chapter outlines an area to address in our artistic unblocking, with exercises such as affirmations, lists, check-ins to challenge core beliefs about being an artist, and ways to override the internal censor that so often sabotages our creative pursuits. Cameron, a prolific author, poet, playwright, and artist, shares her experiences finding her creative mojo and overcoming barriers in her creative career. She encourages readers to open themselves up to inspiration by being playful, ignoring the quest for perfection, and simply showing up. Cameron reckons the acts of coming up with ideas, being inspired, and creativity itself, are all the influence of a higher power. References to God’s input into the creative process are peppered throughout the book, but you don’t have to be religious to find it helpful or to complete the program. The morning pages The practice of writing daily “morning pages” is at the heart of The Artist’s Way, and is one part of this book that I use regularly. Every morning, you write three full pages of whatever comes to mind as a way to clear out negative, superfluous “clutter” and make room for positivity, clarity, and creativity. These pages aren’t designed to be kept or shown to anyone else, let alone published, but the idea is that if you do them daily, creative gems will eventually show up. Cameron says that she’s been doing them every day for years, and thousands of her devotees swear by them. The importance of noticing Cameron shares a lot of herself and her experiences in this book. One anecdote about her late grandmother particularly resonated with me. She tells of her grandmother’s ability to pay attention to the details of life, describing the letters her grandmother wrote detailing her surroundings, which she called “flora and fauna reports.” For example: “the roses are holding even in this heat… My Christmas cactus is getting ready…the little Shetland looks like she’ll drop her foal early.” Her grandmother noticed the beautiful details of life, even when life wasn’t so cheery. Cameron describes her grandmother as “standing knee-deep in the flow of life and paying close attention,” and prods us to do the same, as this is where we find inspiration, connection, and sanity. The Artist’s Way has a knack of either strongly binding or dividing its readers. My dog-eared copy has been a constant companion on my creative journey, as well as the journeys of many, many others. Kate Shannon is a Brisbane-based freelance writer. She spends much of her time in the garden with her two little girls, and loves writing and learning about flowers, plants, and creative people. Follow her on Instagram at @thehanburys. Did you know there is an inherent imbalance in the universe which can be used to your advantage? It's called the 80/20 Principle and successful business entrepreneur Richard Koch reckons anyone can harness it. Working very hard for very little reward? Stop it, says Koch. Focus your attention on the things you do well which come easily to you, take the least time and see the best results, and your achievement and income will soar. Sounds simple, right? Koch says people tend to expect a democratic relationship between causes and results (the 50/50 fallacy): 'that all customers are equally valuable...that each day or week or year we spend has the same significance...that all opportunities are of roughly equal value, so that we treat them all equally'. Not so, says this ‘lazy entrepreneur’. In business 80 per cent of profit often comes from 20 per cent of product, 80 per cent of productivity comes from the top 20 per cent of a company's employees. In life, 80 per cent of your happiness comes from 20 per cent of your time. Fascinating insights with powerful implications for work and leisure. Koch examines in detail how the 80/20 Principle can be applied to business but also how it can be used more personally to create happiness and 'evolve your ideal lifestyle'. His suggested daily happiness habits are nothing really new but useful to remember and put into practice (eg: ‘exercise’, ‘mental stimulation’, ‘doing a good turn’) and his mission to convince everyone to work less, earn and enjoy more gets no arguments from me. His theories are attractive but I have to admit I found the book a little more cerebral than I'm used to reading before bedtime. Happily, according to Koch, it should be possible to read 20 percent of this book to get 80 per cent of his message. Accordingly, I did not read it all (although I promise I read more than 20 per cent!) but that's only because at certain points the invitation was extended to skip chapters if you felt they weren't relevant to your situation. Which makes sense in a book designed to promote effective use of time. I'm quite taken by the idea of reversing this inbuilt imbalance and curious about how I might apply it in my own life and work. I'm going to give it a go and see what happens. The 80/20 Principle: The Secret To Achieving More with Less by Richard Koch is published by Random House. Looking to strike out on your own or maybe you’ve already taken the freelance plunge? You could do worse than to consult this very readable guide on ‘how to survive and thrive as a creative professional for hire’ by Michelle Goodman. My So-Called Freelance Life contains all the topics you’d expect to find in a guide to running your own show (setting goals, creating a portfolio, acquiring quality clients and time management) with the added entertainment of Goodman’s irreverent writing voice. She is funny, chatty and informative. It’s like sitting down for a coffee with a really fun buddy who’s full of excellent advice and smart quips. Far from being a dry instructional tome, this book is full of spirited enthusiasm and humour. And it’s infectious. After reading this it’s hard not to begin hatching grand freelance plans. I particularly like Goodman’s advice about acquiring freelance projects which pay the bills while also making room for the dream projects that might not pay so well. She firmly believes in making time for those projects (after all, isn’t that why you wanted to freelance in the first place?) but also acknowledges the reality of doing bread-and-butter work. She’s also full of great organisational ideas: how to manage your invoicing, client expectations and how to avoid frittering away your time on social media. Like other creative biz guides out of North America, much of the tax and legal business advice is specific to that country, but this information can always be researched locally and doesn’t take up too much space between the covers. On the whole, this book is a useful and motivational tool for anyone toying with the idea of going solo, or for seasoned freelancers wanting ‘to pick up some tips and tricks’. My So-Called Freelance Life: How to Survive and Thrive as a Creative Professional for Hire by Michelle Goodman is published by Seal Press. If you've ever had trouble choosing between projects or find yourself coming up with more ideas than you can possibly see through, Refuse to Choose may come as a revelation to you. This book is for people who feel as though they have to choose just one interest to pursue and leave behind their dozens of other tantalising hobbies or business ideas. This book is touted as 'the revolutionary programme for doing all that you love,' and as someone who's always been interested in many different things I was intrigued by what it might have to say. The good news is Refuse to Choose makes you feel okay about your diverse and sometimes seemingly unrelated interests and wholeheartedly encourages you to pursue them. It also tells you how. Author, Barbara Sher, starts by defining the 'Scanner' personality type. 'Scanners love to read and write, to fix and invent things, to design projects and businesses, to cook and sing, and to create the perfect dinner party,' naming just a few of the interests that might be held by a single person. She goes on: 'To Scanners the world is like a big candy store full of fascinating opportunities, and all they want is to reach out and stuff their pockets…the problem is, Scanners are starving in the candy store'. Sher goes on to explain that Scanners often believe they must make a choice and can only pursue one path. As a result, many people don't choose anything at all and feel frustrated and unfulfilled. The great thing about this book is that it's practical and Sher offers many useful tools. She describes a 'Scanner's Daybook' in which you record your ideas, no matter how fanciful, and explore them to their limit in writing. A binder system, in which a folder is kept for each project, is suggested as a way to keep order and avoid losing great ideas or material. Sher outlines suitable careers for Scanners - too many to mention here - but she discusses in detail different ways to design your life by rethinking your 'career' path. Perhaps easily replaceable jobs suit your plans or highly paid-short term work which pays for long stretches of available time through the year would work for you. I was really excited reading this book and found myself implementing many of the ideas and re-thinking my own approach to how I use my time. Sher insists that it's okay to abandon projects half-finished and move on to the next exciting thing. That's just what Scanners do. But she does say that at some point, 'You need to throw yourself heart and soul into something you love and give it your very best effort. You need to push past your boredom barriers and take at least one of your passions to the absolute limit you're capable of…Hold nothing back'. An inspirational read for anyone trying to work out just how they're going to get to do everything they love. Refuse to Choose: What Do I Do When I Want to Do Everything? by Barbara Sher is published by Rodale Books. Unfortunately it appears to be out of print but you could track down a second-hand copy online or do what I did and borrow it from your lovely local library. Barbara Sher is also the author of many other titles on goal achievement. Visit her website for more information. by Jodi Wiley Everyone's heard of brainstorming but it's not the only way to come up with new ideas. Graphic Design Thinking: Beyond Brainstorming provides enough thinking techniques to break out of even the worst creative rut. The book is an overview of the design process in three parts: defining problems, getting ideas and creating form. Each section goes through the sequence of explaining a concept (such as 'visual research'), providing case studies and finally, giving the reader step-by-step instructions for how to carry out the technique. Many of the thinking tools (brainstorming, of course, and mind mapping) will be familiar to people in a wide variety of fields including design, business and education, to name only a few. But the section 'How to Get Ideas' proved particularly illuminating for me, and is packed full of activities for collaboration and individual processes. The techniques covered might be elementary stuff for the professional graphic designer but some of the ideas could also be a revelation for those seeking fresh inspiration. For example, the section titled 'Regurgitation' advises to go for a walk with a plastic bag, a camera and sketchbook to collect printed ephemera for later study, documentation and transformation; 'Unconventional Tools' describes tracing with toilet paper; and 'Take the Matter Outside' suggests using the natural environment as inspiration for designing new patterns, textures and sequences. One thing I realised as I was reading this book is that almost all of the techniques for generating design ideas can be applied in other contexts. I'm not a graphic designer but this book had me brimming with ideas about the ways I could use some of these prompts as a teacher, writer and artist. Graphic Design Thinking was authored, edited and designed by students and faculty in a Graphic Design MFA program and as such, it does have a textbook feel to it - both in form and content. But this also makes it a great book to dip into rather than read from cover-to-cover (although you could definitely do that too, as I did). It's a perfect resource for the early-career graphic designer but could also provide inspiration for those more established in the field. People engaged in other creative pursuits may also benefit from the thinking techniques and activities provided. Graphic Design Thinking: Beyond Brainstorming is published by Princeton Architectural Press.